This flying banner is about 11 ft. tall to make an impression in any setting. This advertising display has a collapsible design that makes set-up and break down easy. 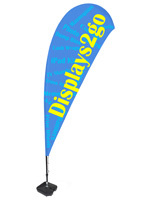 The flying banner, also called a custom teardrop flag, can be used to promote at outdoor festivals and events. Some businesses also use these displays at trade shows and conventions to stand out from their competitors. This custom flying banner has a fillable water base to help keep the stand stable. 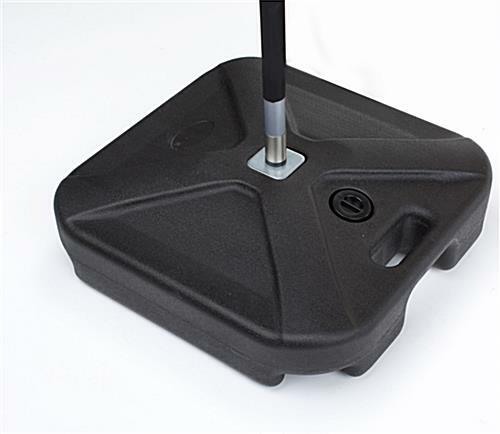 The base can hold up to 6 gallons of water. 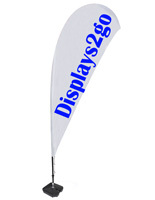 This flying banner includes a bungee cord that attaches the flag to the base. This assists in keeping your custom graphic display taut. The teardrop display stand, flying banner is silkscreened, which is the most economical choice for customers needing large quantities of the same image. There is a minimum order requirement of 10 units for this custom product. 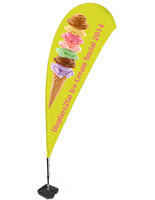 You can have your teardrop flying banner printed in 1, 2, 3, or full color (CMYK), depending on your choice of graphics. The silkscreen printing process bleeds through the fabric, giving a reverse image on back of the fabric. 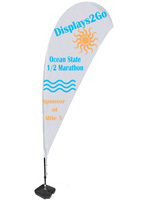 For more complex designs involving photographic images or gradients, digitally printed teardrop flags are recommended, which can be found in the related products to the right. Purchase this custom flying banner to help promote your business at your next event today!